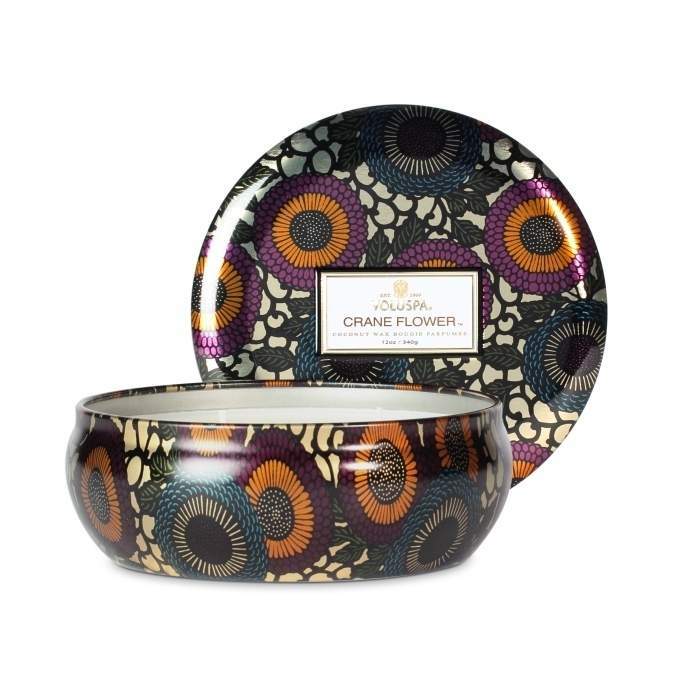 Voluspa Crane Flower 3 Wick Candle Tin. A Voluspa Candles exclusive Creamy Coconut Wax. Fragrance: The Voluspa Crane Flower fragrance is inspired by the colors and beauty of the Bird of Paradise flowers. Notes of Bird of Paradise Nectar, Ripe Grapefruit, Geranium and Lavender . Size: 12 oz., 340 gm. I was first introduced to the Voluspa Crane Flower as a gift from a friend. 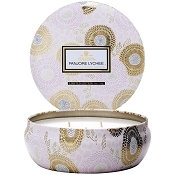 My husband and I both instantly fell in love with the natural, light but heavenly scent! It's not 'purfumee' like so many other candles on the market. I was so happy to find it online at Zanadia, and at a good price too! I loved the container....and therefore bought on a whim without smelling it first....holy cow!....I like it more than my favorite candle I was purchasing anyway (Muscari). Neither are overpowering and make my house feel beautiful.